A few weeks ago I lamented about how much I stink at summer. I’d like to make a shout out to those of you who commiserated with me. at 10 p.m. the night before it goes live. I just barely got most of my kids in bed and I’m holding my youngest while she fights off sleep and I try to type. But this week I discovered a local program that has gotten us out of the house and we’ve done some fun, new activities together. The program is called Play Unplugged. From what I have gathered, companies in the community sponsor different activities. 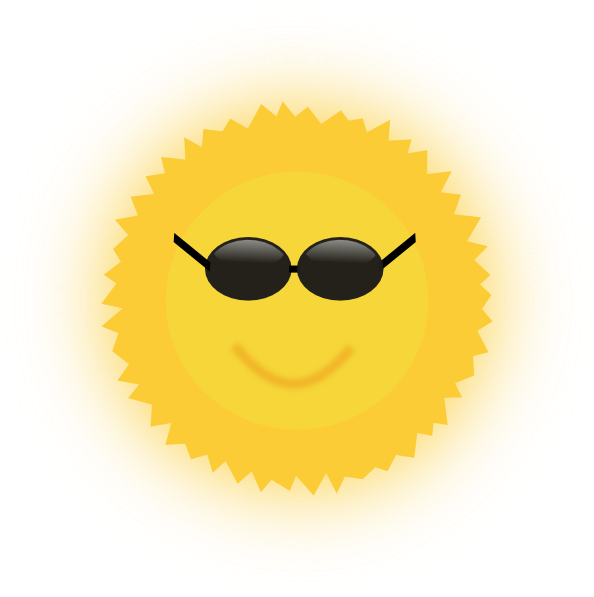 If you kids participate in a sponsored activity the can go to that company and get a coinciding badge (a dog-tag) and some brag points. Once kids in our city receive 20-30 brag points they can head to one of the monthly city council meetings and enter a drawing to win $50. But that’s not the only incentive. Many of the businesses offer fun activities for free. 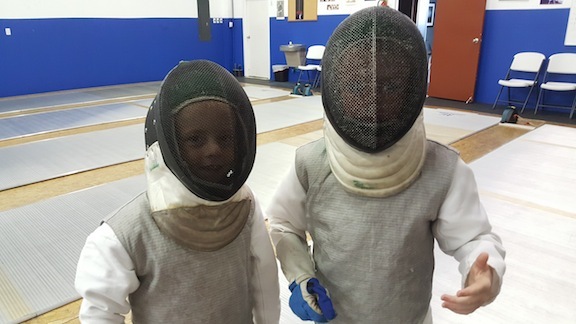 Just yesterday my boys got spend a couple of hours fencing at a local sponsor business. 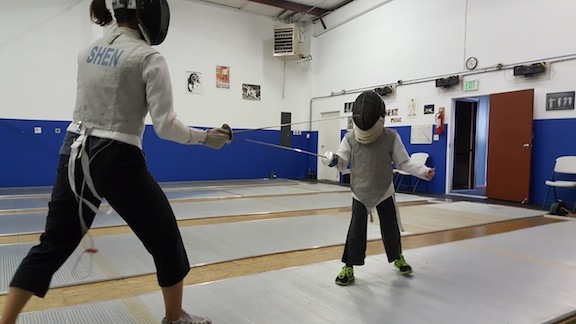 They parried, they lunged and they attacked. They had so much fun they wanted to sign up for lessons. Which I am guessing is probably part of the program’s plan. Not only are these businesses getting kids out and giving moms ideas of new wholesome activities, they are exposing new families to their services. Next Monday we are heading to a karate place to take a free lesson. Then on Wednesday we are going to a retirement center to volunteer with the adults during their reading/craft time. All while earning brag points and badges. One of the activities in our city is to make some s’mores, snap a picture and show it to a local grocery store. Another is to head to gift shop and see how long you can hula hoop while there. I don’t know how far spread this program runs. From what I can tell it’s a Utah thing with about 20 cities participating so far. If there isn’t a city near you, you can purchase badges to do at home. I might purchase some later this year if we run out of city sponsored ones. I’m all about active, fun activities that someone planned for me. Our fifth baby just turned one so it was finally time for my husband and I to invest in a baby gate. Luckily our youngest has been a late crawler and our previous home had a full-sized door to the basement. So we haven’t needed one. 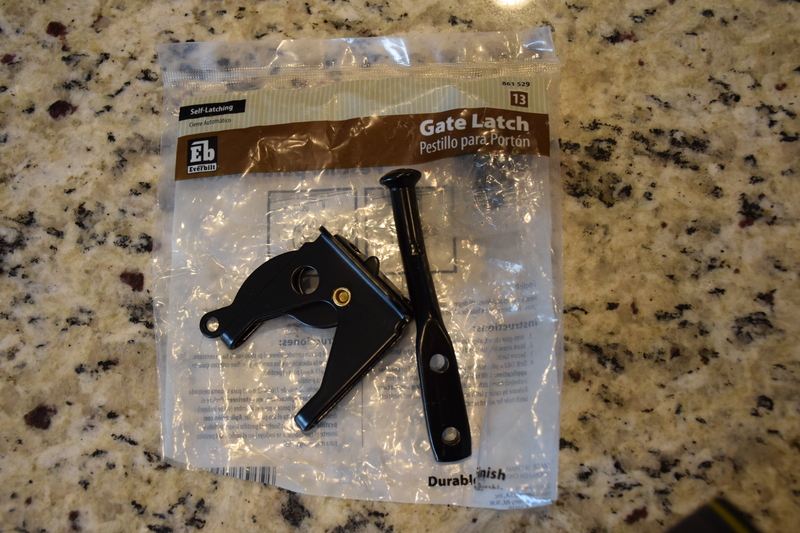 I searched online for a bunch of different gates ranging in a bunch of different prices. But none of them caught my eye until I searched for wooden gates on Pinterest. There were beautiful gates with easy how-to instructions. Instantly I wanted a wooden gate. The only problem was I didn’t know if I could build one and the ones to purchase online were on average $150 – too much for my taste. That’s when I spotted the old graffiti-laced wooden tool hanger we took down from our garage. I have been saving it for months and had big plans of turning it into a piece of Subway art in my living room. But it was bigger than I thought and I couldn’t decide what wall to put it on or what saying to put on it. So I left it in my garage until last week. When I held it up to the top of my staircase and discovered that it fit the space perfectly. Suddenly project wooden baby gate was born. 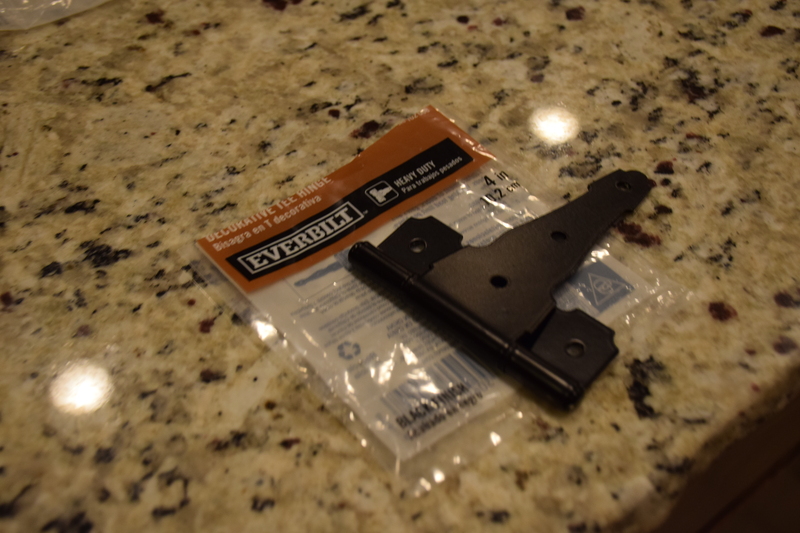 My husband and I took a trip to Home Depot where we purchased two 4-inch heavy-duty hinges, a heavy duty latch, some 14″ black zip ties and a 4-inch wide piece of lumber. 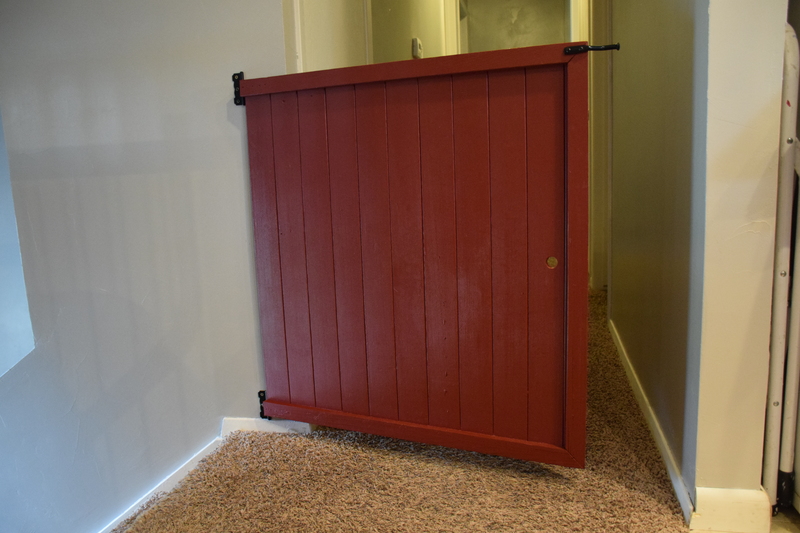 I wanted the to gate to match my new red barstools so my husband took one of them apart and I took its leg into Home Depot and had them match the color. I bought a quart of paint and got busy. 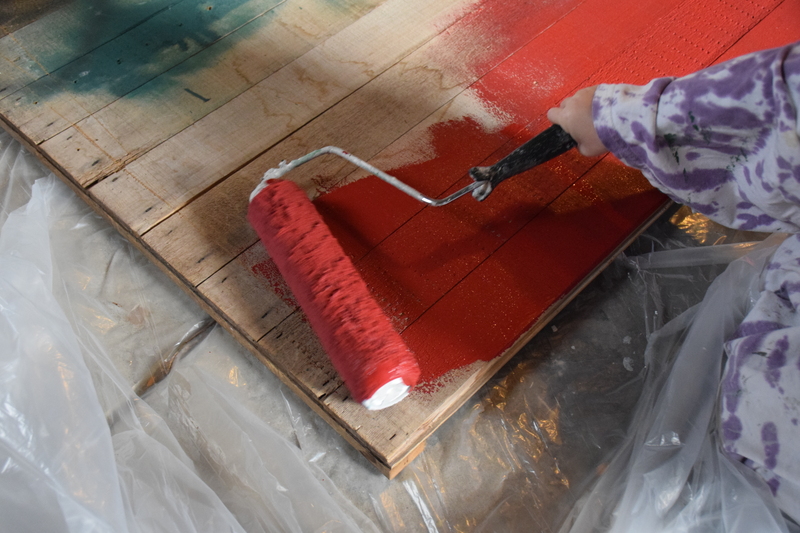 I painted the front and back of the wooden tool hanger – with the help of my three-year-old of course. We covered up that weird mask-faced smile in the corner of the wood. 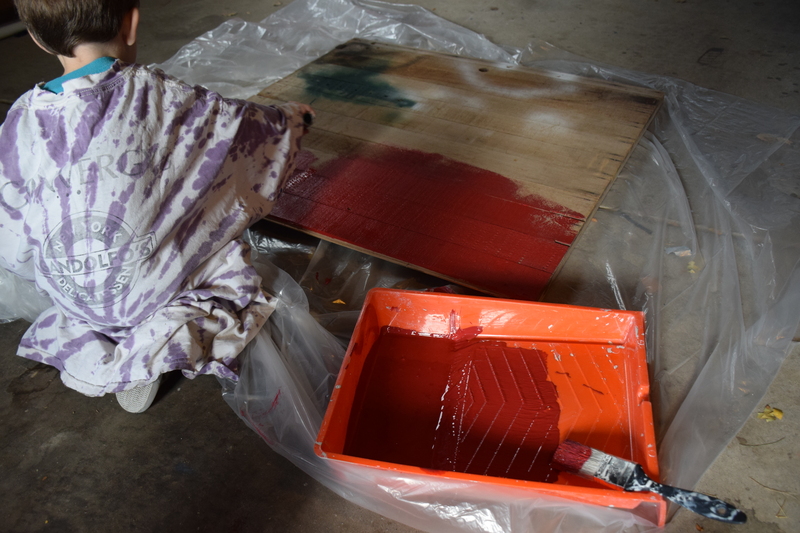 Then we waited for it to dry. Last night my husband marked the wood where the hinge would go then predrilled holes for the screws. Then he attached hinges to the top and bottom of the wood. 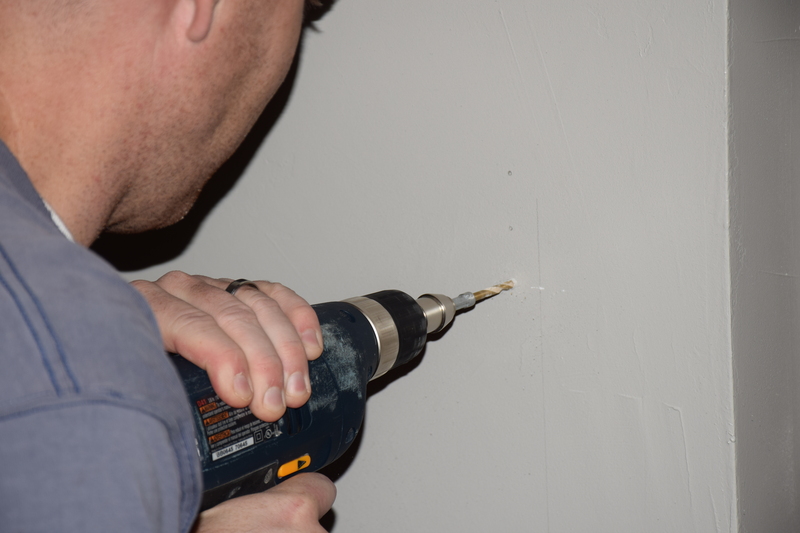 Then he used a stud finder to locate the closest stud on the wall next to the staircase. He marked the stud with a straight line on the wall by using a level and marked where the holes for the hinge would go. 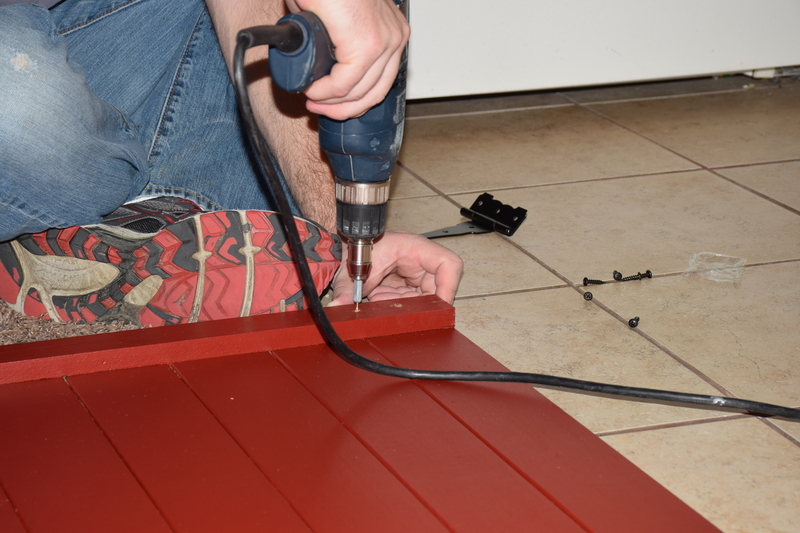 Then he pre-drilled those holes too. It took us a couple of tries to figure out how we wanted the door to swing. 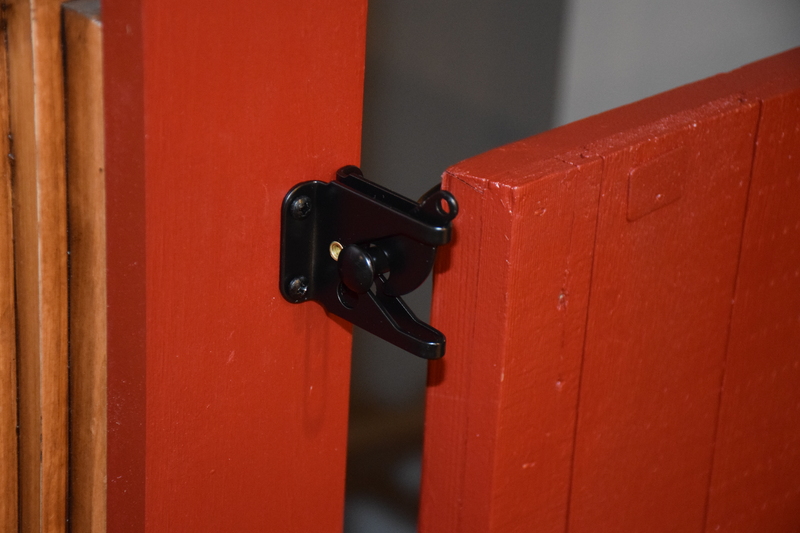 We ended up mounting the hinges to the wall with the hinge flush to the wall. 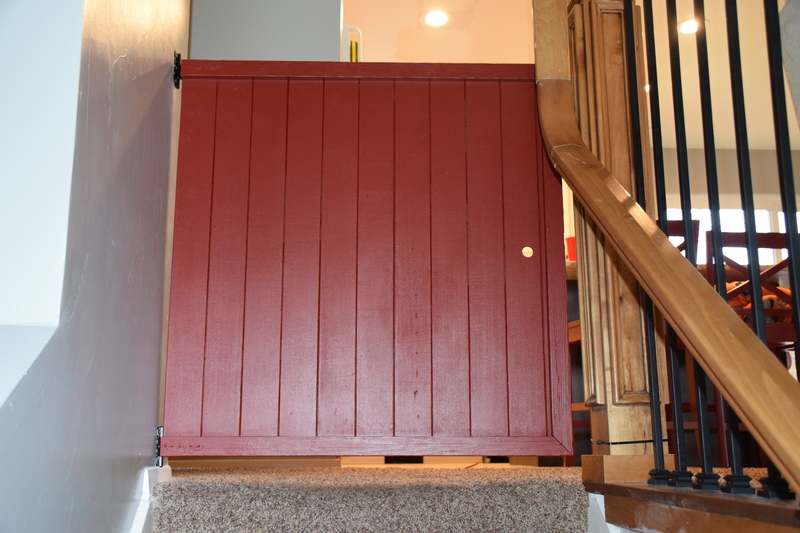 Then we attached the hinges to the red gate. It swings beautifully. 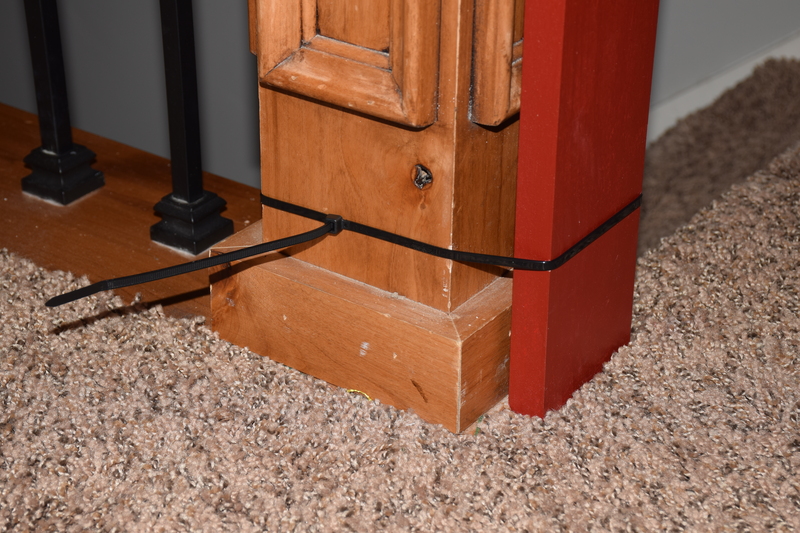 Next my husband took two 14-inch black zip ties and hooked them together. Then he wrapped around the post of our banister and the piece of lumber we bought at Home Depot. 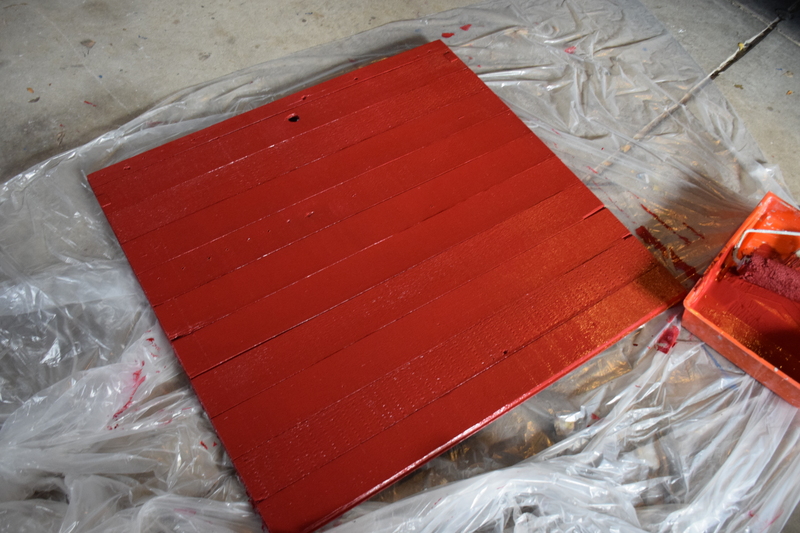 I painted that red as well. 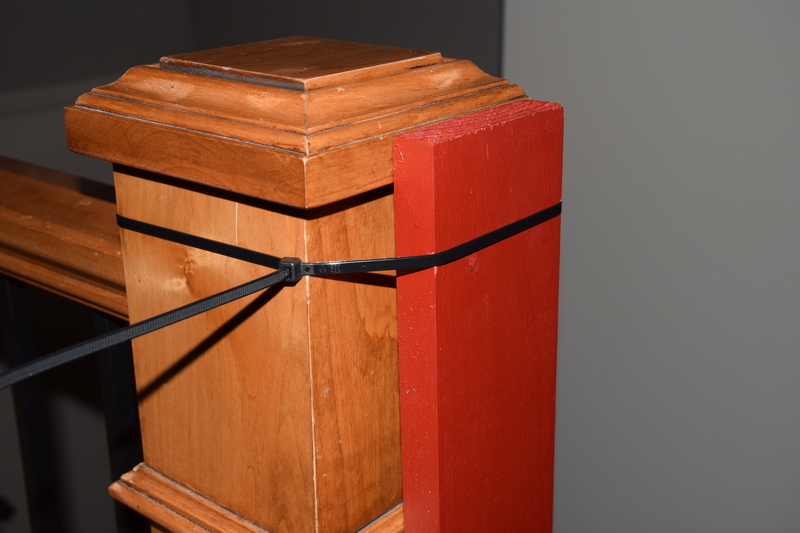 He wrapped twist ties around the top and the bottom of the post to make it more secure. 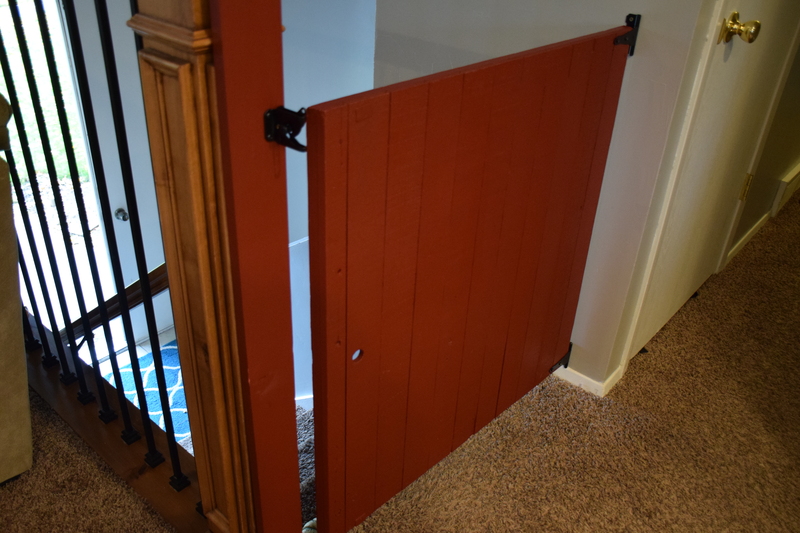 The piece of wood allowed him to fasten the gate’s latch to the wood without drilling into our post – that way we can easily remove the gate some day. Finally he added the latch. It looks amazing and swings beautifully. And the whole thing cost less than $30. Wahoo! We did it. I am so happy. Now I have one less thing to worry about. 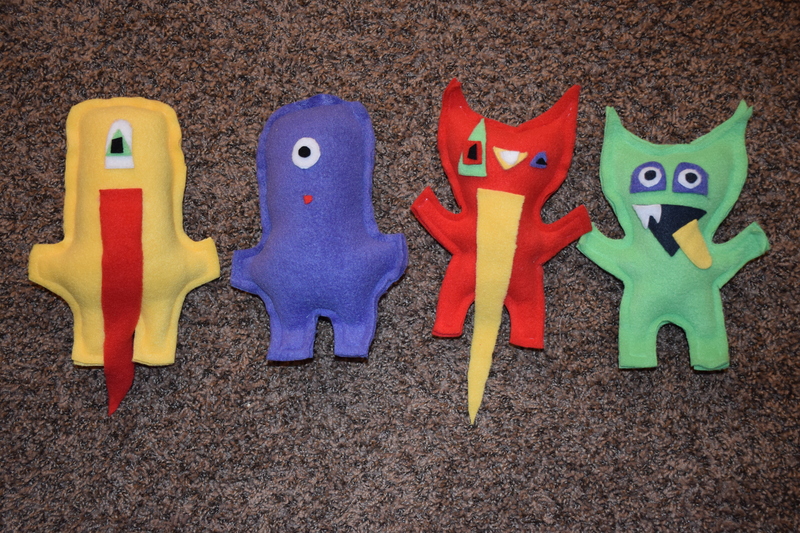 This week I made some fabric monsters with my little monsters. And it wasn’t even scary. 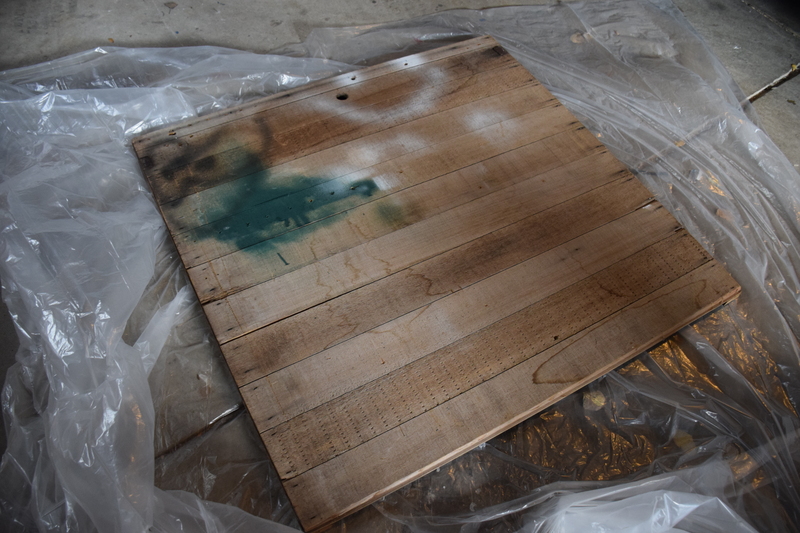 Sometimes I take on projects with my kids and I think that I am going to scream by the end. It tries my patience. This time I did some prep work to make it easy and less stressful. 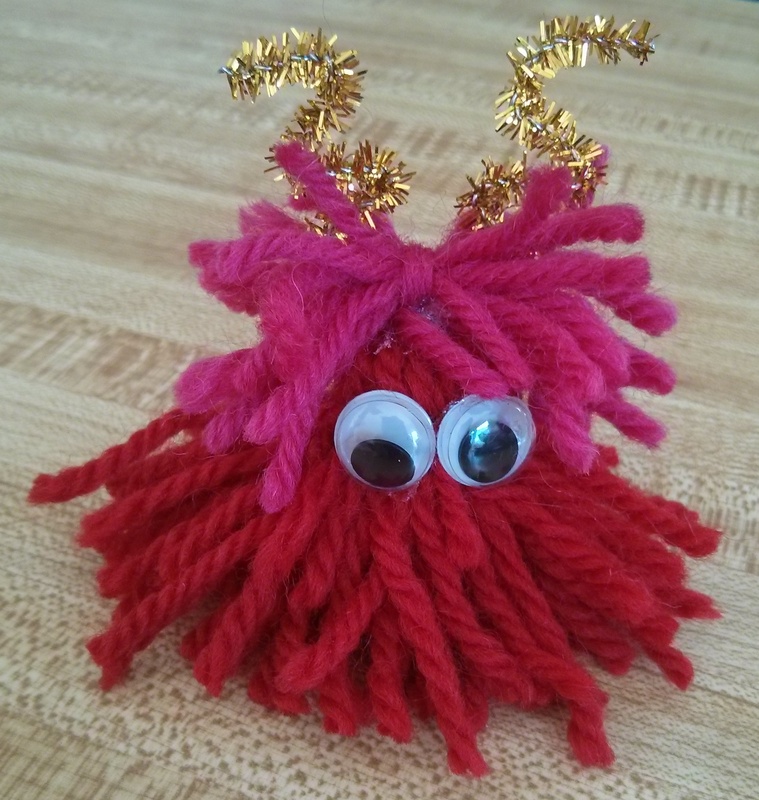 We used the pattern from this blog as a base for our monsters. We made more than 60 of these recently at a church service activity I was in charge of with the women in my neighborhood. We are donating them to a local children’s hospital. That’s when I promised to make some of our own at home…that they could keep. I cut out the monsters from fleece ahead of time. I got ¼ of a yard of several different colors. 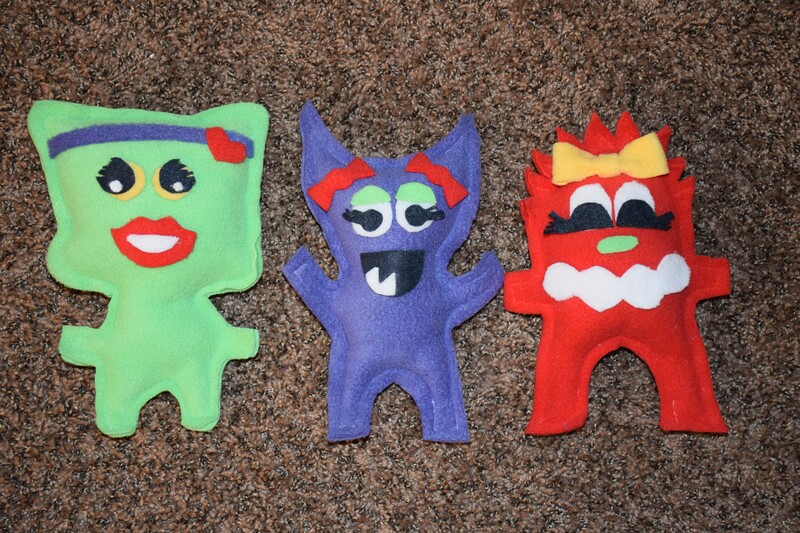 The fabric was so wide that I was able to make three monsters out of each color. We used white, green, red, yellow and purple. 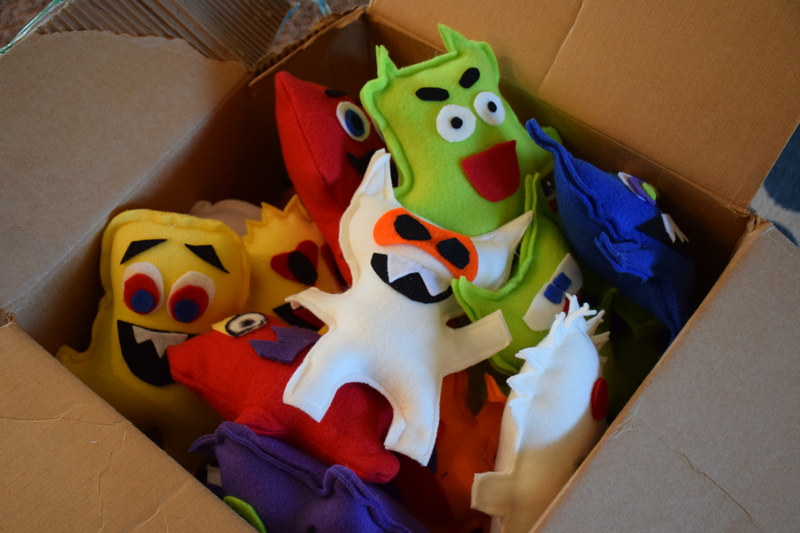 Then I sewed them mostly shut – I left a small opening to stuff the monsters. I did all of this before even enlisting the help of my boys. They got to help stuff the monsters. 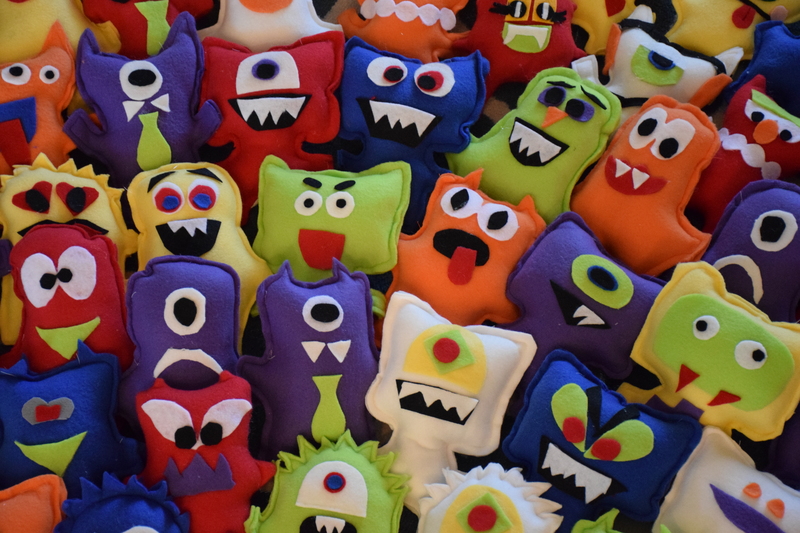 I had a medium size bag of stuffing and we used it all on our 15 monsters. The boys loved pulling the fluff apart and shoving it inside their new friends. After we stuffed them all we called it quits for the day. 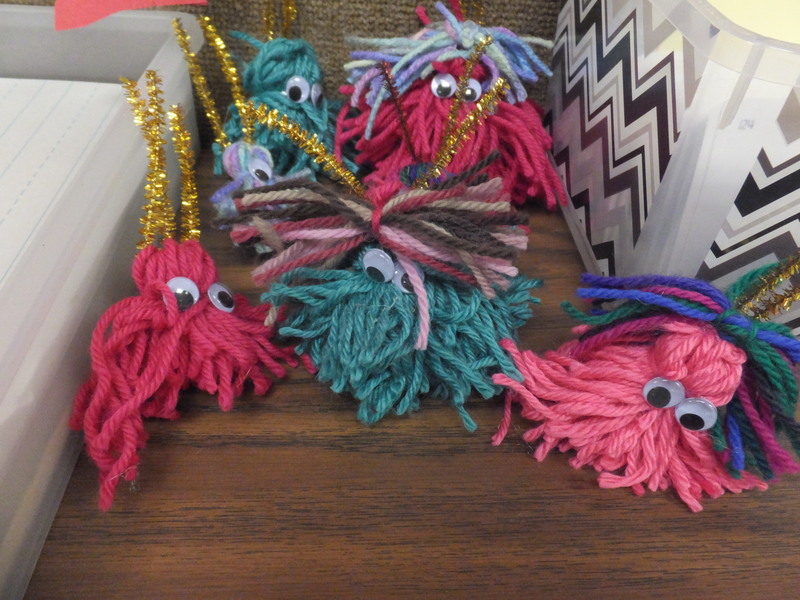 Then, when they were at school and napping a couple of days later, I sewed all the monsters shut. That night we took the fleece scraps from when I cut out the monsters, added some black felt, and started dreaming up face shapes for our monster crew. 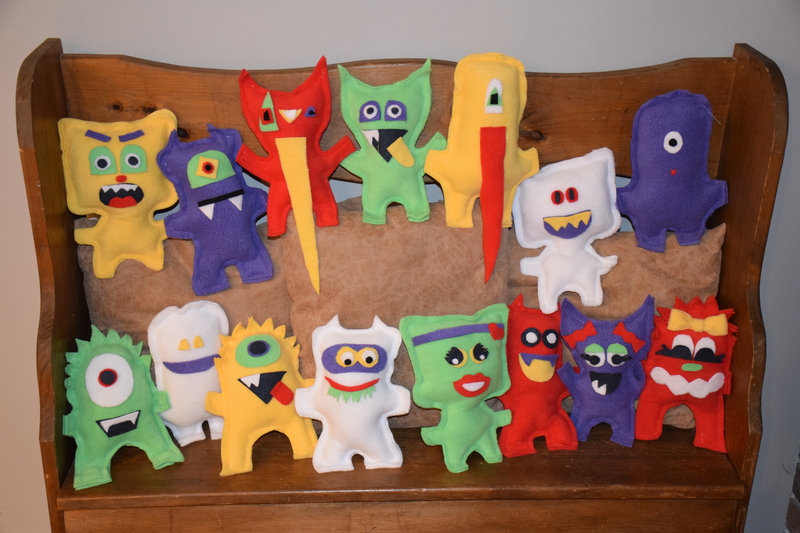 We giggled as we added crazy teeth, long tongues and wacky eyes to our lot. I let the kids help for a little while then shipped them off to get ready for bed with dad while I finished working on the rest of the faceless monsters. They each turned out so cute and so different. Just like at my church activity. 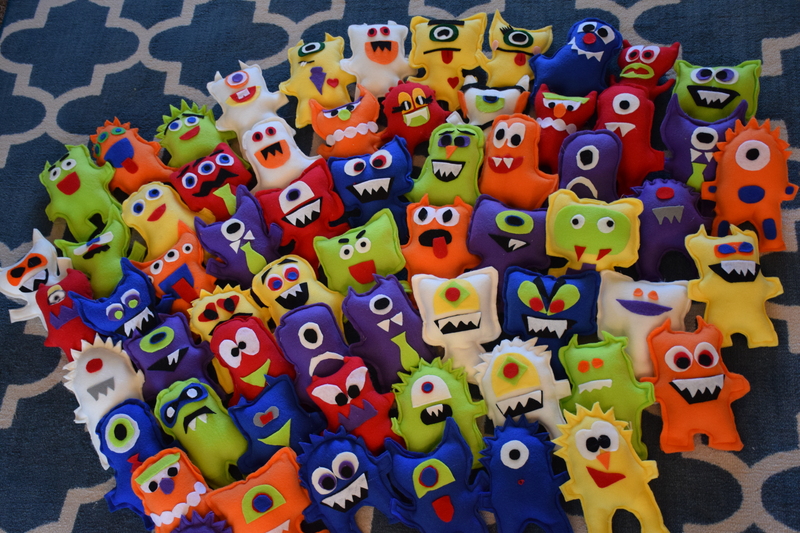 Each of the 63 monsters we made for that activity was unique. I couldn’t help it I had to take a picture of them all. If any of you get the urge to make some of your own, send me a picture of how yours turn out! Here are the four designed by my boys. I couldn’t resist making a few female monsters. 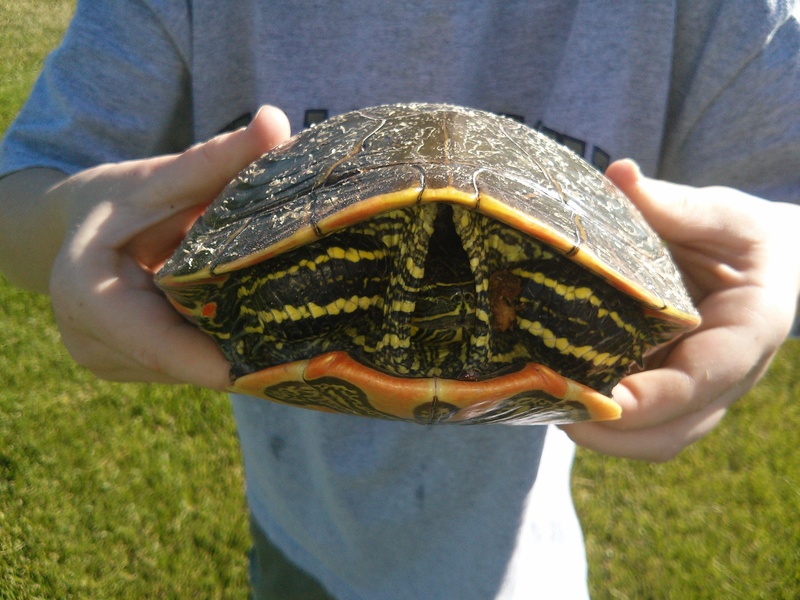 The one in the middle is my baby girl’s monster. Here they are all on our toy bench. They seriously are my new favorite Halloween decoration. 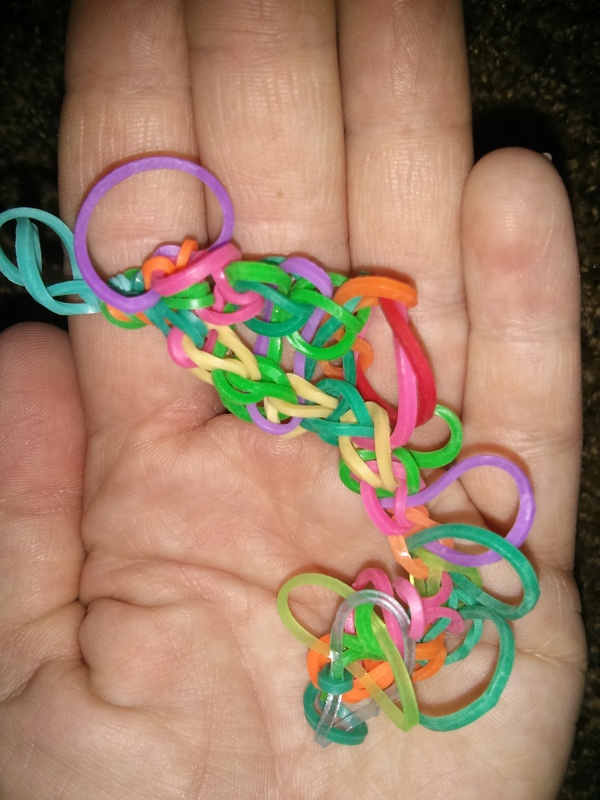 Does anyone remember when small, colorful rubber bands were used in crazy, high-centered intricately woven ponytails instead of hooked and looped on looms to make key chain/bracelet creations? I want my crazy hair back. I’m tired of our rubber band looms. Well, let’s be honest here, I’m not necessarily tired of the looms, I’m tired of the rubber bands. They are everywhere! And I’m not talking about them being everywhere you go – the grocery store, the craft store, the gas station. I’m talking about them being everywhere in my home. I don’t know where they are all coming from. I have bought my boys a few packs here and there but I think they have lost half of the bands in my couch cushions or in my vacuum cleaner. It’s a wonder they still have any left to make anything. 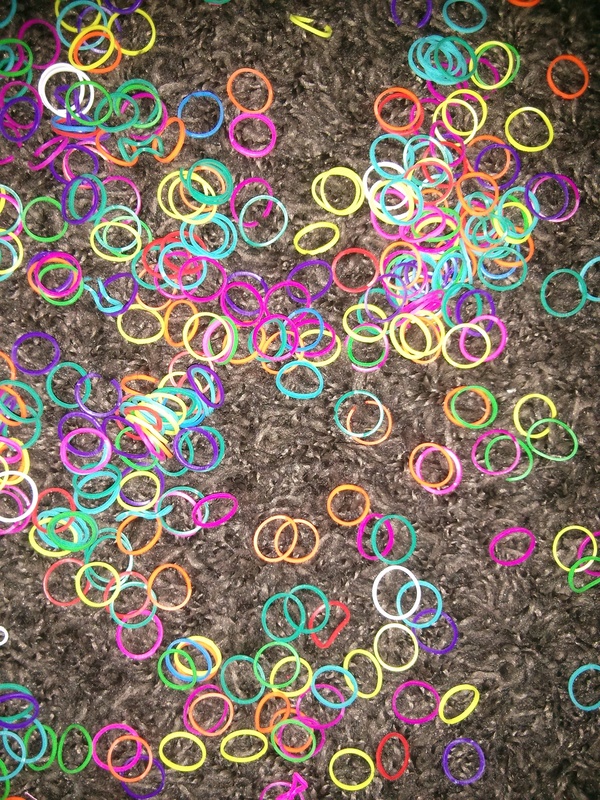 I used to cherish small, colorful rubber bands. I would hoard the tiny braces bands and use them to braid my hair for girls’ camp. I remember parting and separating my hair to make rubber-band anchored headbands around the top of my head. Now the bands are a dime a dozen. They sell for dirt cheap and come in every color and scent imaginable. Whose big idea was it to take those bands and use them to fuel a giant rubber band weaving world? It was brilliant. I wish I would have thought of it. My boys both have looms now. They even have an extra loom that they borrowed from their grandma. She also let them borrow a new kit of 2,000 glow-in-the-dark bands. Little does she know she probably won’t get nearly half of those back. 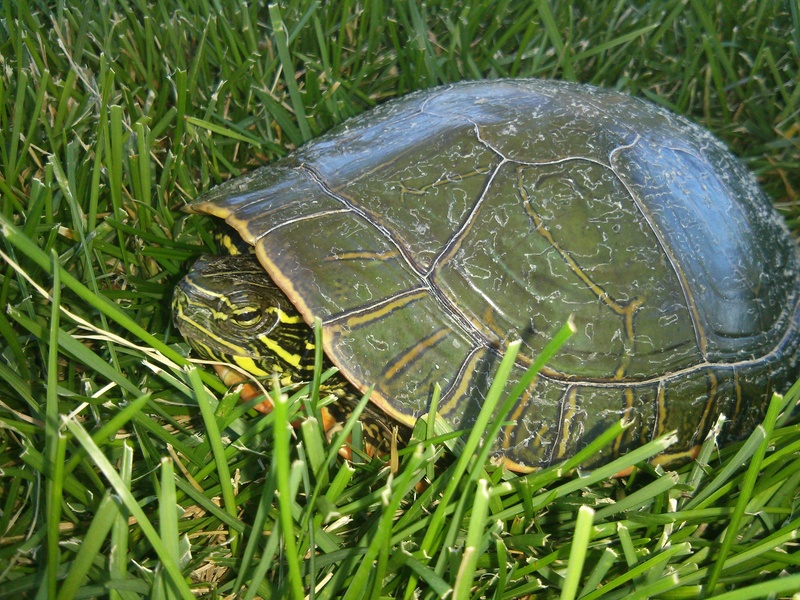 They’ll end up ground into our carpet or huddled in the corner of our cars. I like the looms. I like when my boys sit quietly making their own bracelets. I like when they carefully lie out bands beforehand and get things organized and ready to make something. The problem is they NEVER do it that way. Normally I’ll walk into the living room to find a mountain of bands spread all over my carpet several yards away from their looms. They scoot back and forth from their bands pile to their loom, brushing them with their small fingers deep into my carpet. They are hard. I think I get in a hurry so I try to place the bands too quickly then I loop them in the wrong order and when we pull it off half of the bands fly back and hit us in the face. Luckily we found a bunch of YouTube video tutorials on how to make things. That has been the only way we have had success. 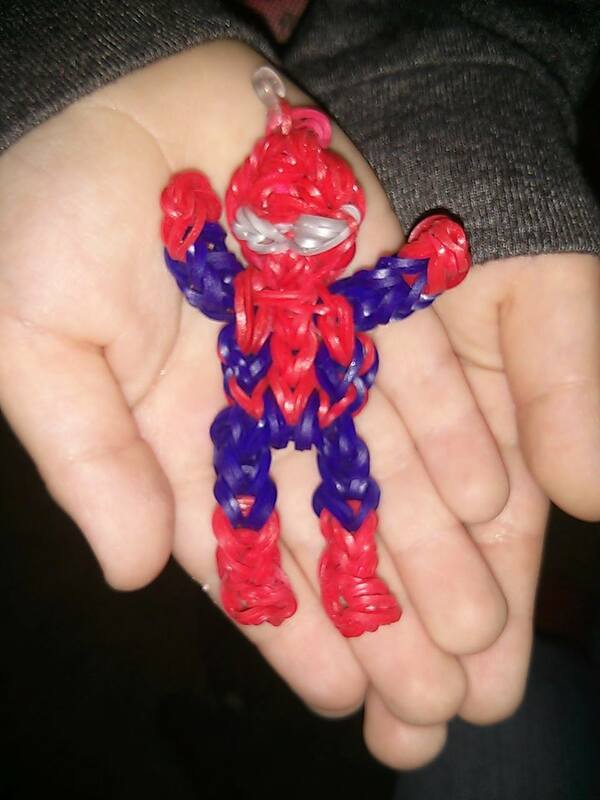 We even pulled off making a Spider-Man. That was a serious victory. But I don’t always have time to sit and watch a 40-minute video on how to make a waterfall-style bracelet and help my boys step-by-step – because if you have ever tried making one of those bracelets, you will know that you need to follow each step precisely. You mess up one time and the whole things turns into a rubber-band rats nest. I’ve started picking up bands and tossing them. I know I shouldn’t. I know we will probably need them one day, (like the time we watched and followed an Olaf tutorial for more than an hour only to find out that we were a few white bands shy of being able to make the cute, animated snowman) but I’m sick of them peppered throughout my entire house. The other night before dinner my youngest son put a couple of bands on his thumb, wearing them like a ring. That was fine and cute until he shoved his hands in his mouth in order to eat all of his macaroni and cheese and one of the bands ended up in his mouth. I had to scoop the food/rubber band wad out before he choked. Help! How can I make this work? How can I make this fun? My boys love it. I need to calm down and realize that a few bands strung all over my house is not the end of the world. But it’s getting to me. I’m about ready to melt them all down and make myself a giant, colorful paperweight. Maybe I’ll just steal them away and use them in my hair. In a little more than 24 hours I will get my kids back. School will be OVER!!! 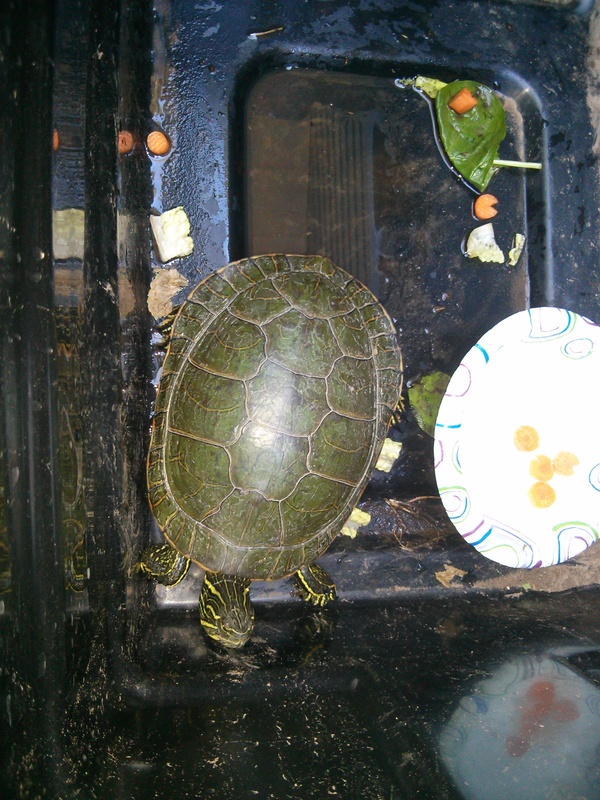 They will be all mine until August. I love having them home. That said, I know we will need lots of things to keep us from driving each other insane. So I asked the boys to help me make a list of things they wanted to do this summer. Number one from my oldest was: take a trip to New York. Number one from my second oldest was: take a trip to California. Nice. After I dashed their dreams of having an awesome out-of-state vacation, we made a toned-down sensible list with local attractions. Below you will find a list of the top 10 things we want to do this summer. Also, I’ve rounded up some pretty awesome blog posts from other bloggers on fun activities for kids. I know I’m going to take advantage of all of these creative ideas during the next several weeks. I’m too tired and overwhelmed to think of everything on my own. 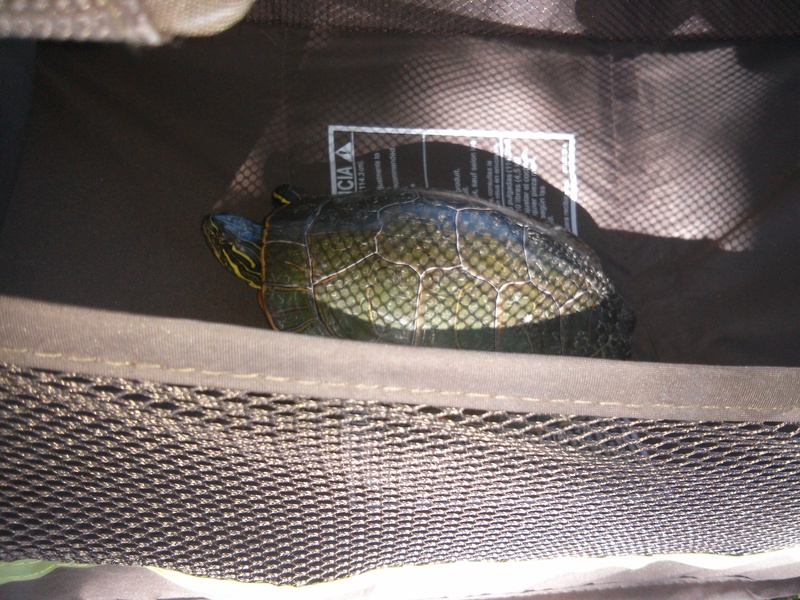 I love that people share their ideas – I hope they don’t mind me sharing their blogs here. Let me know what you are going to do this summer. Maybe I’ll steal some of your ideas for our family. Hopefully this summer will be epic.